It’s transformation Tuesday, which means we are sharing a fun DIY project! My good friend Bethany with The Posh Home has amazing design style and taste! I asked for her help to highlight my modern style in my traditional kitchen without breaking the bank. Bethany suggested an easy way to achieve a new modern look on a budget, was to update the kitchen hardware. 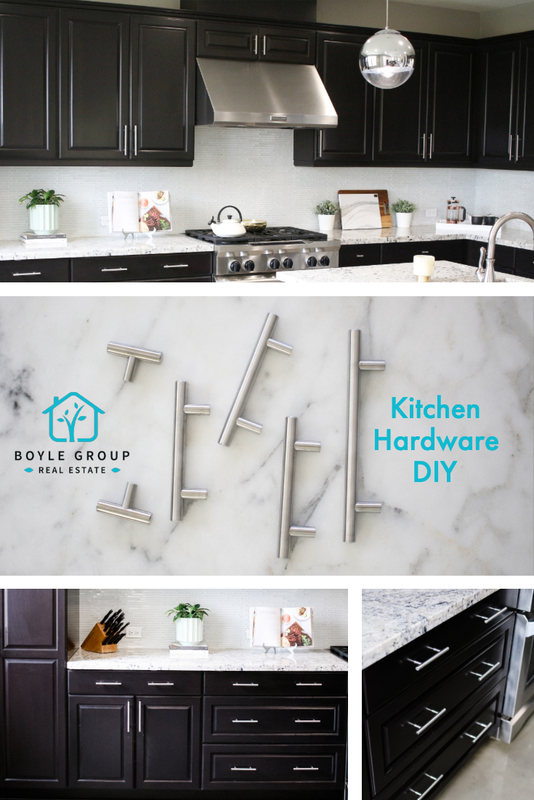 Once Bethany selected the new modern hardware for my kitchen, we decided it would be fun to DIY the project. This is an easy project that anyone can do with some essential tools. Wait until you see the before and after below! The new modern hardware Bethany selected for my kitchen made such an impact. 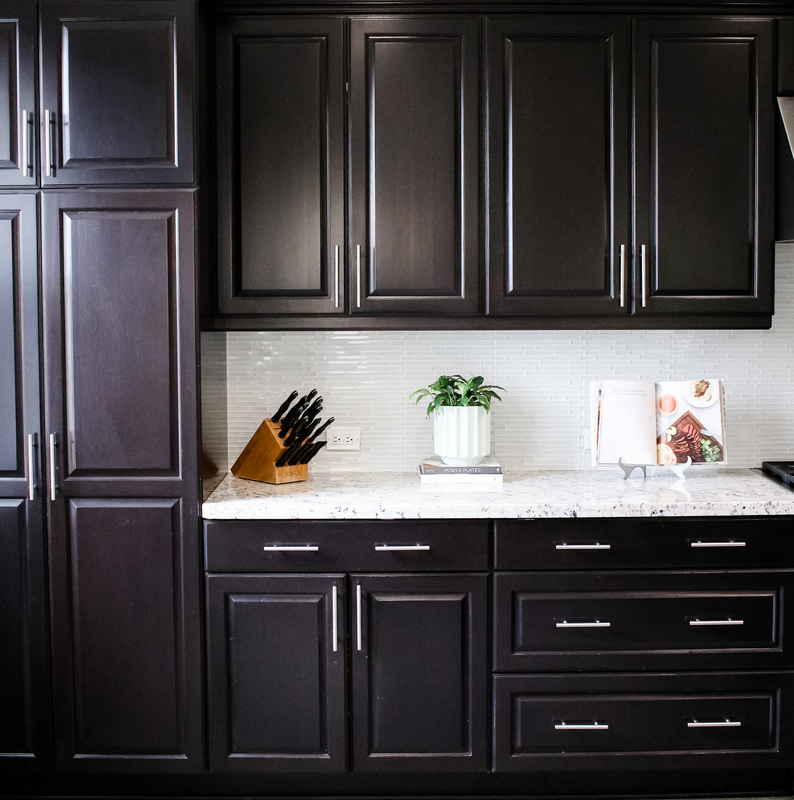 We are excited to share with you all this Kitchen Hardware DIY Project: How To Update Your Traditional Kitchen Cabinets With a Modern Twist. Emtek gifted the hardware, however all opinions are our own. For small drawers center the pull or knob in both directions. For drawers 22” and up, we recommend to double up on knobs and pulls. Divide the drawer into thirds and position the hardware on the left and right sides of the drawers. For placing the hardware on the doors we recommend placing the hardware centered on the lower frame of the door starting above the inset. There are a few essential items we recommended for updating your kitchen hardware that will make this project a breeze. 1) New Emtek Hardware –That’s a given! We chose modern pulls over knobs since it achieved that sleek modern look we were going for. 3). Template For Drilling New Holes – This is a game changer! 1). Measure for new hardware. We decided we didn’t want to patch any existing holes so we specifically found hardware from Emtek that worked with the existing holes and we easily drilled new holes with our hardware template. 2). Select and purchase new hardware. We love Emtek hardware, they had so many great options! We recommend utilizing a drill and a screwdriver for this step. Use soap and water to wipe down your cabinets after removing existing hardware. Cover up any marks or scratches with a touch-up pen that matches your cabinet color. We utilized a screwdriver and the drill for this step to make it go quicker. The hardware template is a game changer! This was so helpful to measure and mark the new holes. When utilizing the hardware template measure your hardware center to center and mark on the template so you can easily mark the new holes. Typically, two screw lengths are provided with your hardware. Chose the screw length that works best for the thickness of your cabinets and drawers. Tighten new hardware and make sure it’s level. 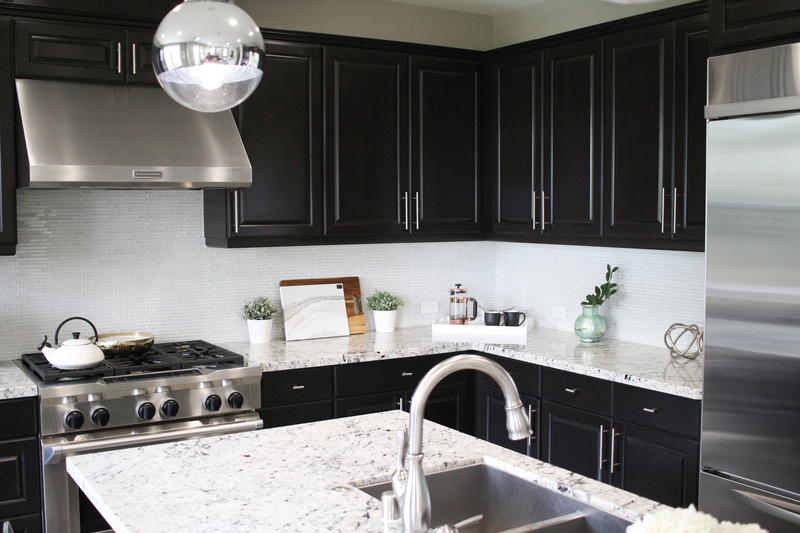 We hope you enjoyed this Kitchen Hardware DIY Project: How To Update Your Traditional Kitchen Cabinets With a Modern Twist on a budget.